ST. PAUL, Minn. (CNS) — Catholic youths from the Archdiocese of St. Paul and Minneapolis were among those stuck on the Pennsylvania Turnpike overnight on the way home from the annual March for Life in Washington. 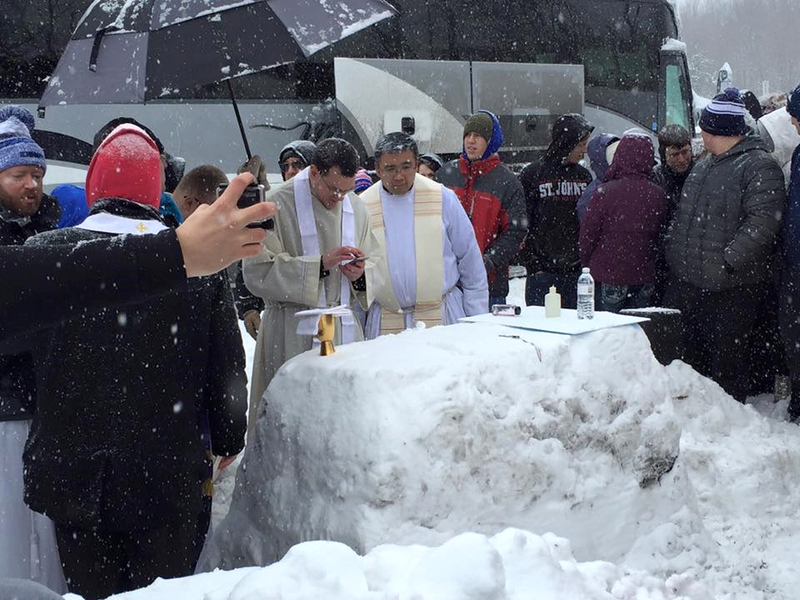 And they had stories to tell that include attending an impromptu roadside Mass complete with a snow altar. “Each trip has something in it, but this one will be hard to forget,” said Jack Dorcey, a chaperone from St. Pius X Parish in White Bear Lake. The Minnesota buses carrying about 130 people left Washington after the march Jan. 22, but didn’t beat the storm that slammed much of the East Coast. At 8 p.m., they came to a stop on the Pennsylvania Turnpike — about 100 miles east of Pittsburgh, and hunkered down for the night. Traffic was at a standstill after a tractor- trailer jackknifed near a mountain tunnel and snow continued to accumulate on roads before the accident was cleared. Bill Dill, from the archdiocesan Office of Marriage, Family and Life, said the group had plenty of snacks and fuel, but several people ventured out the next morning to get water. That’s when they noticed many buses from the march and struck up conversations with fellow pro-life advocates, many of whom were Catholic. “You can imagine the fraternity among these people,” he told The Catholic Spirit, the archdiocesan newspaper. While meeting up with others also stuck on the road, Dorcey met a priest from the Archdiocese of Omaha, Nebraska, who suggested they have a Mass. Students already were playing in the snow, so Dill and Dorcey asked them to make an altar, which was no small feat in the powdery snow. Dill and his wife, Tiffany, walked along the roadside inviting people to Mass, which was celebrated by Father Pat Behm from the Diocese of Sioux City, Iowa, and concelebrated by at least six other priests. Dorcey estimates about 600 people from a handful of states attended. “People just started filing in. It was really cool to look on both sides and see people just streaming in to come to Mass,” said Dorcey, who offered his umbrella during Mass to protect the Eucharist from the snow. Pat Millea, high school faith formation director at St. Michael in Prior Lake, played music. Before the Mass, Dill said one of the priests notified the local diocese, Altoona-Johnstown, of their plans considering the unusual circumstances and canon law requirements. Dorcey said Mass was quick, but everybody was able to receive Communion. By the end of Mass, the buses were starting to move. When they left, someone stuck a pro-life sign in the middle of the altar to commemorate the occasion. The group got back to St. Paul around 3:45 p.m. Jan. 24 and their trip officially ended with a Mass at the Cathedral of St. Paul, celebrated by Father John Ubel, the rector. He said that group leaders had discouraged the students from bringing their cellphones, but technology ultimately spread their pro-life message. One girl used Twitter to share details about their roadside Mass. Soon after, a news station from the Twin Cities contacted her, and word spread from there. Other March for Life groups stuck on the Pennsylvania highway included students from the Franciscan University of Steubenville, Ohio, and Duquesne University in Pittsburgh and three buses from the Diocese of Green Bay, Wisconsin. Maria Schuette, director of religious education and youth ministry for the Diocese of Green Bay, who was interviewed by phone Jan. 23 from one of the buses, described the delay as another opportunity for the group “to practice what it means to be pro-life. The diocesan pilgrims: parish youth groups members, Catholic high school students and chaperones, turned the negative experience into a positive, she told The Compass, Green Bay’s diocesan newspaper. Schuette said students provided people with bottled water and invited them to use the bathrooms on the bus or simply get warm. Through a March for Life Facebook page, the group had been able to keep in contact with family and friends during their ordeal. She also said it was an opportunity for the group to pray for others. “All the kids stepped up,” she said, noting that they prayed the rosary not only for their own rescue, but for the safety of national guardsmen, the highway patrol and fellow travelers. Another group, four busloads of pilgrims from the Diocese of Kansas City- St. Joseph, Missouri, were especially grateful that their chartered bus service figured out how to find a spot off the road with hot food and shelter. The group of 160, including students, deacons, chaperones and eight priests, avoided the standstill traffic by taking a detour and arriving at American Legion Post 113 in Bedford, some 23 miles to the east, where they had a warm meal and slept on the hall’s floors before resuming their trip the next day. “It’s very, very scenic right now,” one of the pilgrims, Michael Aberer, told Catholic News Service Jan. 23. Trygstad is assistant editor of The Catholic Spirit, newspaper of the Archdiocese of St. Paul and Minneapolis. Contributing to this report was Sam Lucero in Green Bay and Kurt Jensen in Washington.